It’s day three of our epic journey through the wonderful deep-sea creatures featured on this variant cover for Aquaman #31. Have you taken a shot at naming all 18 species, yet? We identified species 1, 2, and 3 on Monday and 4, 5, and 6 on Tuesday. 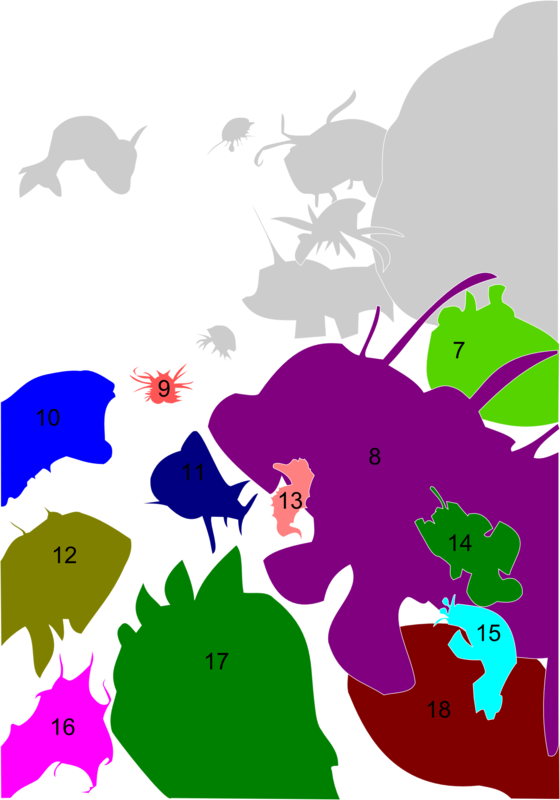 Today we continue with 7, 8, and 9, one of which is is a major fishery. I’m not afraid to admit that, of all the species on the cover, this fish is the one of which I’m least confident in my identification (I’m an invertebrate guy, after all). 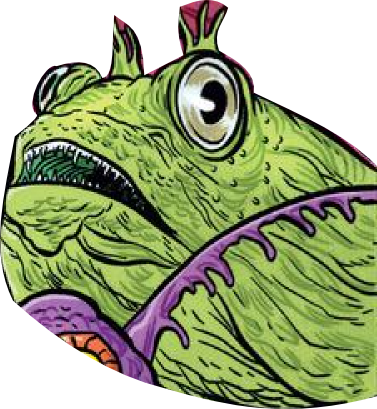 Without a fin or tail to compare, this one was destined to be the trickiest, The mouth and bulbous body initially suggested sea toad to me. 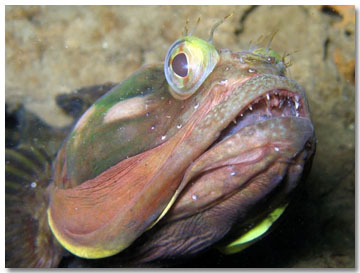 But on further reflection, The “eyebrows” large eyes, and upturned mouth make me think Sarcastic Fringehead. It’s not a perfect fit, but based on the general shape and the protrusions above its eyes, I think this is as close as it gets. It’s fitting that the incredible, edible monkfish should occupy the largest space on the cover. Another ambush predator, this fish can grow up to a meter and a half long and is found in deep waters from Newfoundland to Florida. 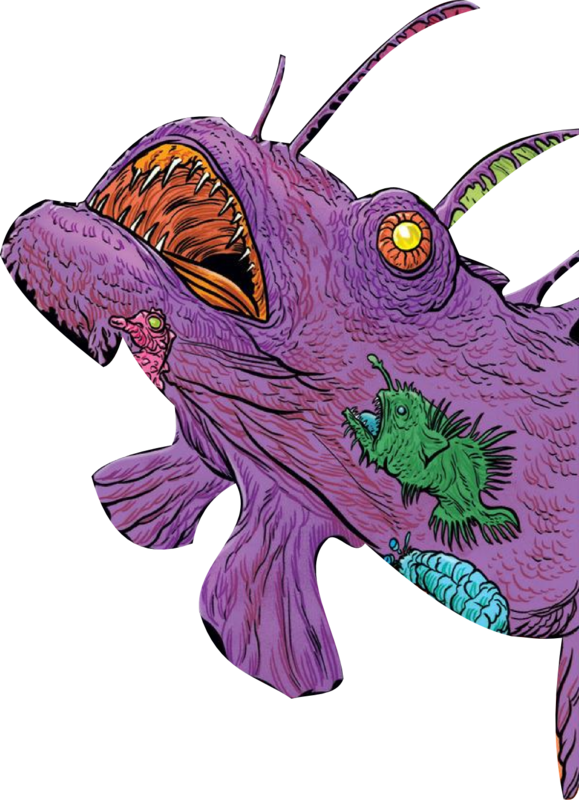 It uses its modified pectoral fins to walk along the bottom, creeping up on unsuspecting prey. It is the only fish that lays its eggs in a floating veil of mucus. People eat monkfish. 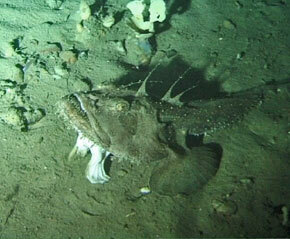 Like most deep-sea fisheries, the monkfish fishery is considered unsustainable. The large muscular tail is cut into a boneless fillet, protecting diners from the rather unappealing image of a monkfish’s face. One must wonder how appealing this dense, flavorful fillet would be if you had to meet your meat first. Ok, that’s not really the common name for this uncommon worm. Like other worms on this list, Nereis sandersi has no common name, but just look at that face. It’s a piece of goof news away from a full on Kermit flail. 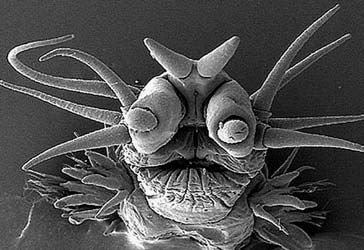 Another deep-sea worm of which almost nothing is known. Nereis sandersi. Photo by Chris Allen. More than anything else, working through these species highlights just how little we know about deep-sea organisms. There’s a whole world out there waiting to be discovered, and we’ve only just scratched the surface.